Lithe Skateboards was founded by Mark Rosolowski and Greg Rosolowski. The board you’re currently riding is changing all the time. With every Ollie, every Kickflip, every time you put weight on it – the wood fibers are being strained and slowly degrading. Many top competing pro skaters change their decks daily because they know how important a consistent feeling board is for the consistency of their skating. Our decks are designed to keep a consistent feel, so you keep your tricks more consistent and keep learning new ones. Lithe decks have more pop and keep that pop through their life – you will have bigger Ollies! Many decks that use carbon fiber feel very stiff – we put extra time into ensuring our decks have a very similar flex to a maple deck. Because of how durable they are, they last an average of 6x longer than a standard maple deck – and for many skaters, it last even longer than that. A lighter, stronger, and more durable skateboard deck – our Slate technology is the big change skateboards need. 100% made and sourced in the USA, our Slate deck is mostly constructed from the same Maple that is used in most skateboards. Carbon fiber inlays are added to reduce weight, improve strength, and maintain resilience through the life of the deck. Ultra-high-strength Hybrid-Polymer™ tip-fills are added to prevent chipping and delamination, and reduce razor tail. This material also has a high rebound which adds significant pop. This unique construction allows this board to last an average of 6X longer than a standard maple board. Our Hybrid-Polymer tip-fill is the main feature that sets our boards apart from the rest. It has pop that’s more responsive and crisp than a fresh maple deck – and it’ll stay that way through its life. Its virtually impossible to “chip” and has significant “razor-tail” resistance. Another key feature of our Slate technology is the use of carbon fiber inlays. By using carbon fiber we are able to reduce the weight and thickness of the deck, while increasing the resilience and strength. Carbon fiber has earned its place as a household term, but every material has its strengths and weaknesses. The carbon fiber is thoughtfully inlaid to protect against fraying – maintaining its structural integrity. As soon as we receive funding at the end of our 40-day campaign, you will be able to place an order and choose the exact board you want on our website. You will not have the option during the Indiegogo checkout process – don’t worry, we’ll make sure you get the board you want! Any of these models can work for your type of skating – we just categorized them based on the input from competing amateur and professional skaters. But, if you’re a tall street skater that would like a longer board, the Vert board might be perfect. Likewise, if you’re a vert skater that prefers a smaller board, the Tech-Street may be your match. This board is based on the current most popular board shape; the nose is slightly steeper and longer than the tail, and has a medium concave. If you’re having trouble choosing a model, we recommend starting here. 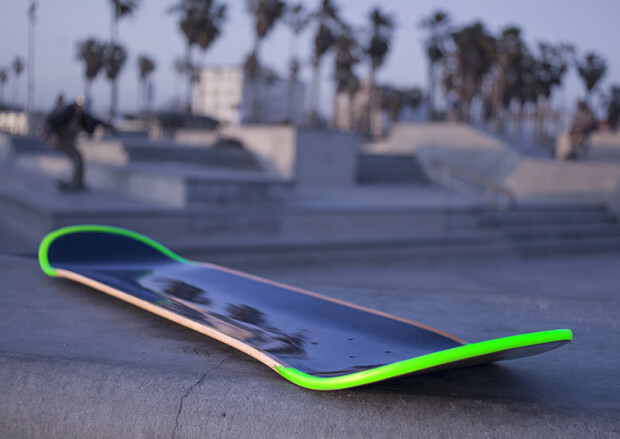 A smaller board with mellow twin tips and mellow concave. Both the nose and tail have “2 fingers” length of flat behind the bolts giving the deck a more responsive feel. 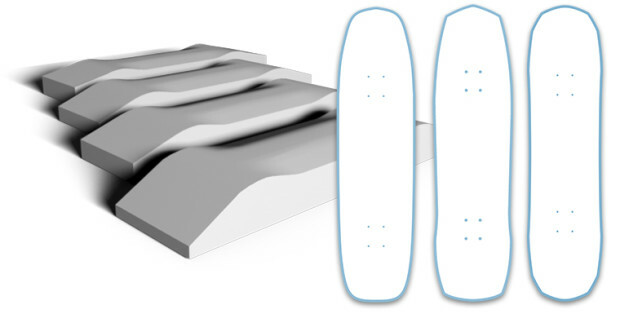 A bigger deck with medium twin tips and a mellow concave. A longer wheel base gives the deck a more stable feel for higher speeds on bigger ramps. Our biggest board and longest wheelbase. Deep concave, steep tail and an even steeper nose which gives a very cupped in feel. “2 fingers” length of flat behind the bolts makes the board feel very playable even with its large size. This board is geared towards younger, smaller riders. It has a short wheelbase and mellow twin-tips and concave. Not just a sticker – you will receive an awesome assortment of various colors and sizes of Lithe Vinyl decals. 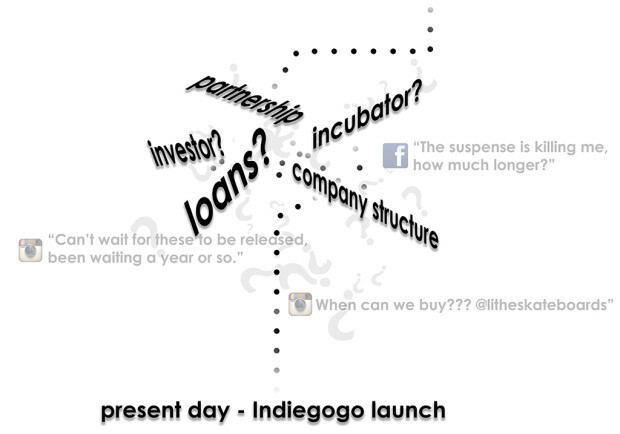 You will receive a Lithe T-Shirt available in S, M, L, and XL. Pledge $159 or more (Get Funded) Get them while they last! You get to choose the model, size, and possible options (see “Stretch Goals” section below). You will receive 2 Lithe Slate decks. You get to choose the model, size, and possible options for each individual deck (see “Stretch Goals” section below). Intended for retailers, you will receive 5 Lithe Slate decks. Intended for retailers, you will receive 10 Lithe Slate decks. Upon reaching our funding goal, we’ll be able to produce our Slate decks with a simple screen printed graphic on a maple bottom. If we raise over $40,000 we’ll be able to provide more graphic options and the option of a slick-bottom without any additional charge to our backers (after Indiegogo, the slick-bottom option will have an additional charge). If we raise over $60,000 we’ll be able to provide the option of different models and shapes to better fit your riding style. After getting tired of heavy boards, in March, 2011 we decided to try and make a lighter board by only making it five plies thick, rather than seven, and maintain it’s strength by wrapping it with carbon fiber. 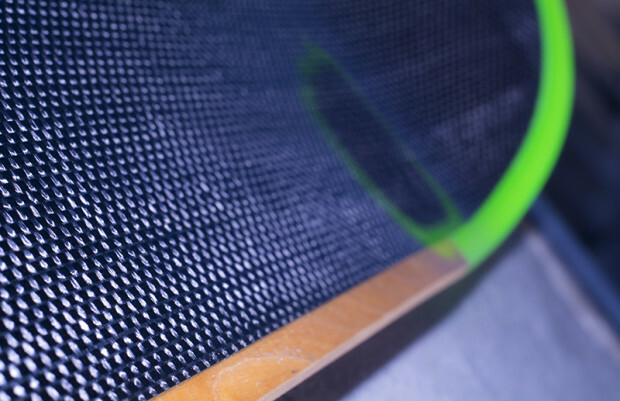 In addition, the tips of the board had a Kevlar laminate underneath the carbon fiber to reduce wear on the ends (i.e. 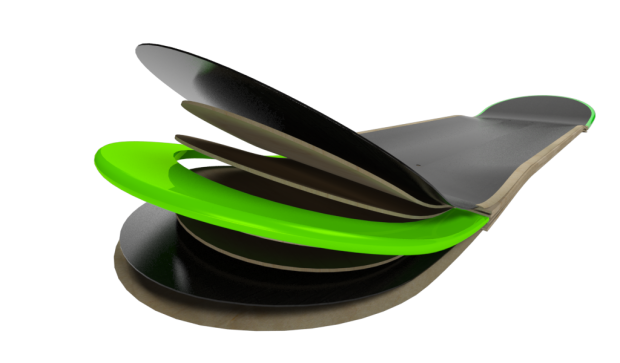 “razor-tail”) – making skateboards took time and we wanted it to last as long as possible. Unexpectedly, the board had better pop; and many other skaters in the park tried and confirmed it. Everyone was able to Ollie higher with this board. It seemed the combination of light-weight and the extra resilience from the carbon fiber was to thank. The thin, carbon-black board looked like a piece of shinny slate – this was the first Slate deck. But after weeks of riding, we discovered that the Kevlar laminate became soft, reducing pop, and that fraying carbon fiber is very irritating on the skin. 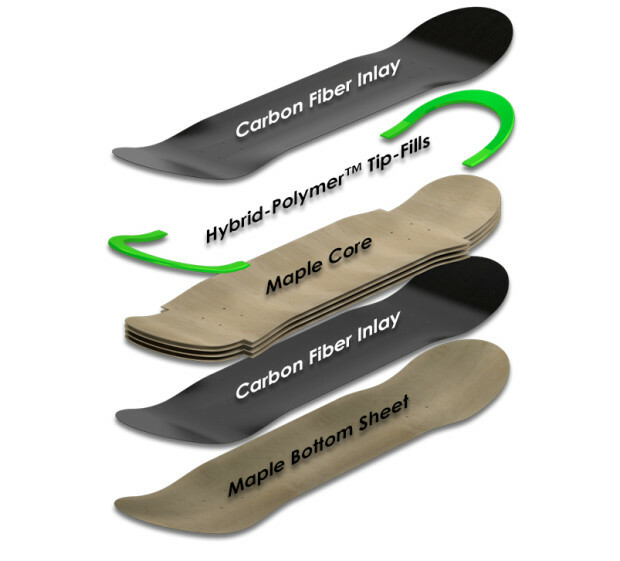 In June, 2011, soon after the first Slate deck, we attempted to reduce the carbon fraying by eliminating the carbon fiber at the ends of the board and replacing it with black ABS plastic tips. 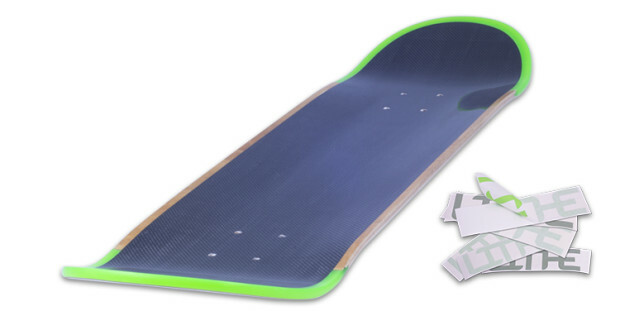 The ABS plastic had a slight improvement in wear resistance over a standard maple deck, but the tips would break off after a hard impact and the remaining exposed carbon fiber still frayed while doing boardslides and tailslides. After many, many attempts at adhering a wide variety of different plastics to maple, using different layup techniques and pretreating the plastics in countless ways, we finally had a breakthrough in August, 2013. This new plastic, which we coined a Hybrid-Polymer, is a blend of a variety of plastics that has a high durometer (it’s very hard) and has incredible impact strength, wear resistance, and adhesion to maple. This board was ridden for well over a year and has withstood more abuse than any other board (maybe ever?). While skating the Mega Ramp at Woodward West for the Signal Snowboard’s Every Third Thursday shoot, this board’s nose split a sheet of Skatelite in half at 40 mph and only got a mere scratch on the bottom maple veneer… it truly has proven itself. After such a successful prototype, in May, 2014 we created our first prototype of a production model Slate. Designed from the bottom up with strength, durability, aesthetics, and large scale production in mind, we finally had an incredible board for the masses. 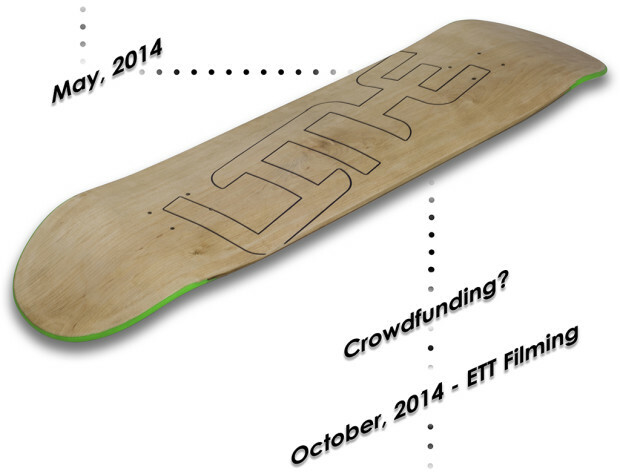 We began work on our crowdfunding campaign and made many new friends in the action sports industry. After filming the Every Third Thursday episode with Signal Snowboards, we were approached by possible partners and investors. But after well over a year with no launch in sight and fans becoming impatient, we realized that it would be faster to first launch on Indiegogo to finally get these boards under the feet of skaters. The guys at Braille Skateboarding put our deck to the test! Check out this amazing episode of Every Third Thursday that features us making a Lithe Slate deck and Lithe Slate style snowboard. We are very pleased with our production prototypes, but we would like to make minor adjustments and tweaks before we make the tooling to manufacture our first large batch of boards. You may have noticed that the amount the carbon fiber inlays varies between the CG renderings and actual photos; the board you will receive will likely be somewhere between these two amounts. Also, the exact weave of the carbon fiber may be different from the CG renderings and photos. The exact dimensions of the boards may be tweaked slightly as we get them dialed for production. The graphics shown are works in progress. They are likely to change and more options are likely to be available. (only applies if we meet our stretch goal). The exact colors may, or may not, vary slightly from what you see in the picture. The graphic may be different and more options may be available. Any modifications to what you see on this Indiegogo page will be in good faith to maximize performance and aesthetic appeal. At this point we hope that we’ve convinced you that we build some pretty awesome boards – the only thing we haven’t done is a large scale production of them. That being said, we are experienced in product design and manufacturing, we’ve put a lot of time and thought into the engineering of the tools and logistics of a large-scale production, and we have full access to Signal Snowboard‘s factory to launch our company from. We are certain you’ll get an amazing board, but unseen obstacles may or may not delay the delivery date.